Y Suffer in Silence founder Paul Greenall fears for the future of the charity. A mental health support group could be facing a bleak future due to its struggles to meet running costs. The Y Suffer in Silence network in Fraserburgh was launched to help people suffering from anxiety, depression and stress two years ago. It aims to support sufferers by giving them a chance to share their worries through its listening service. As well as offering one-to-one support, the charity also operates a helpline. But the charity founder now fears for the future of the service because it is struggling to survive with £10,000 of annual running costs. 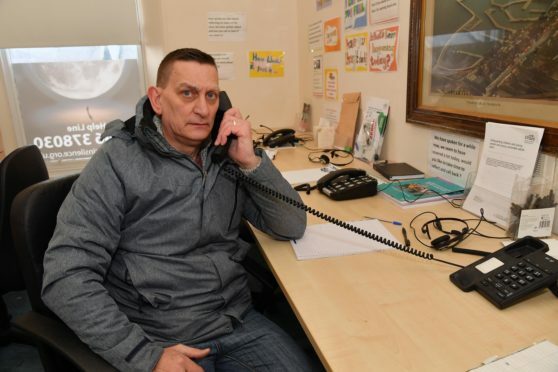 Paul Greenall has approached the council in the hope that the local authority can help with funding the rent for its base at the old Thomas Walker Hospital on Charlotte Street and the phone bills. But he claims his calls for support have fallen on deaf ears. Mr Greenall stressed that he could not carry on financing the project himself. He added that the charity could be forced to close its doors in Fraserburgh if it receives no financial assistance. He said: “We’re doing everything right and we’re delivering a service but there’s no support from the council. “I’ve spent a lot of money on the charity out of my own pocket and I can’t continue doing that. Y Suffer in Silence is run by volunteers and all of its services are free of charge to members of the public. Helpline volunteers are trained to support people in Fraserburgh and the surrounding areas.